When the members of the great unwashed masses think of an astronomical telescope, they usually think of a refractor. With a large glass objective lens at the top of the tube and an eyepiece down at the bottom, refractors are the most robust and conceptually simplest type of telescope. They offer amazingly crisp views of the Moon and planets and double stars. But they are not for everyone. This short article goes through the pros and cons of refractors for astronomy and helps you decide if such a telescope is right for you. Developed by Dutch eyeglass makers in the late 16th century, refractors were the first telescopes. The great Italian scientist Galileo also learned to make simple refractors, and he was the first to turn such a telescope to the night sky in 1609. Early refractors like Galileo’s had a single glass objective lens ground to a spherical curvature. These simple early lenses caused much image distortion near the edge of the field of view. To reduce this distortion, early refractors needed large focal ratios, which meant even telescopes with a small objective lens were enormously long… ten to twenty feet or more. A replica of one of Galileo’s first refracting telescope, on display at the Griffiths Observatory in Los Angeles (credit: Michael Dunn). Single lens refractors had another problem. They focused red, green, and blue light rays to different focal points, a problem called “chromatic aberration”. This caused the images of stars and planets to have colored “halos” and greatly reduced the sharpness of images. In the mid-1750s, a lawyer named Chester Moore invented a refractor with two objective lenses, each of which was made from a different kind of glass to partially correct for chromatic aberration. Today, all refractors have this type of “achromatic” objective. Because they have clear apertures with no obstruction, refractors produce the highest contrast of any telescope which makes them superb for visual observation of fine detail on the Moon and planets. This is especially true for refractors with achromatic lenses and a focal ratio of f/10 or longer. Still, even achromatic refractors, especially those with a focal ratio of f/8 or less, tend to show false color, especially on brighter objects. While generally low maintenance, refractors are expensive compared to their aperture and light-gathering capacity. But refractors are light, simple to use, mechanically robust, and show sharp images of brighter celestial objects. If you’re mostly interested in the Moon and planets, then an achromatic refractor may be the right scope for you. You can get an 80 mm or 90 mm refractor and a reasonably solid mount for $300-$400. Larger achromats with objective diameters of 100 mm, 127 mm, and even 152 mm are back in style. 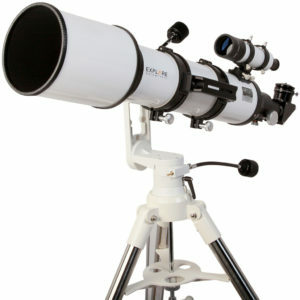 Explore Scientific, for example, offers an f/6.5 152 mm achromat (without a mount) for just US$800. In the past thirty years or so, led by companies like Televue and Astro Physics, new fluorite glasses and innovations in telescope design have led to “apochromatic” refractor lenses that show virtually no false color, even at focal ratios of f/6 or f/7. “Apos”, as they’re called, are fantastic telescopes, with razor sharp images and superb contrast. These refractors are favored by astrophotographers and visual observers of the Moon, planets, double stars, and larger nebulae and open star clusters along the Milky Way. The down side of “apos”? Top-notch apochromats are shockingly expensive, up to $1000 per inch of aperture. In the past few years, however, many well-reviewed refractors that use simpler “ED” lens designs and new materials have hit the market. For example, you can get a decent 4-inch ED optical tube assembly (mount not included) that gives you tack-sharp images of planets and wonderful contrast on binary stars and stunning wide-field views of the Milky Way for only $1,000 or so. If you have good dark sky and your main interest is in objects that benefit from ED or apochromatic lenses, you should try such a telescope at a star party and see if it’s right for you. The images produced in a good refractor are hard to equal with reflector telescopes. But for most stargazers, a 6″ (152 mm) lens is about the largest that’s affordable and portable. So if you want to go after fainter objects such as globular star clusters and galaxies, you will be somewhat limited.